Two of Vietnam’s coastal destinations have been listed among the world’s ten most outstanding tourist destinations by Lonely Planet Magazine, according to the Vietnam National Administration of Tourism (VNAT). Ha Long Bay, in the northern province of Quang Ninh, has made it onto the list of the 10 most outstanding coastal destinations. 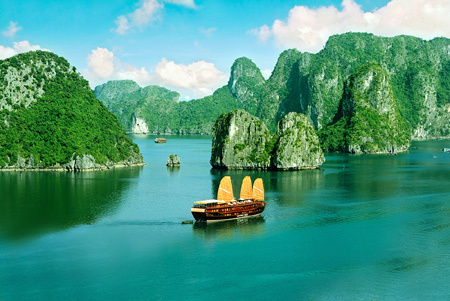 About 500 ships ply the waters of Ha Long Bay, designated as the World Heritage site in 1994, carrying millions of tourists every year, according to the VNAT. Quang Ninh has attracted 5.3 million visitors so far this year, 2.5 million of whom visited Ha Long Bay. Provincial Park in Canada, the Kerala backwaters in India, New Zealand's Milford Sound Bay, the Greek islands, Disco Bay in Greenland, and the Galapagos Archipelago off the coast of Ecuador. Con Dao Islands, an archipelago off the coast of Ba Ria-Vung Tau Province, was listed in the top 10 most mysterious and outstanding islands in the world for an ideal holiday. The island was featured for its unspoiled beaches and dark history as a site for inhumane prisons – often known as the Alcatraz of Southeast Asia. The list includes Socotra off the coast of Yemen, Australia’s Torres, Yaeyama from Japan, Iles du Salut of Guyana, Ulleungdo from Korea, San Blas Islands from Panama, Taiwan’s Penghu; Bay and Hog Islands of Honduras and Uganda’s Ssese. Nice blog! I like your writing way. I like tourism in Vietnam . I think it is useful for everyone.